Deploying and Managing a Cloud Infrastructure is an excellent resource for IT professionals seeking to tap into the demand for cloud administrators. 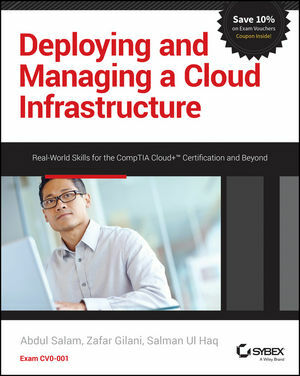 This book helps prepare candidates for the CompTIA Cloud+ Certification (CV0-001) cloud computing certification exam. Designed for IT professionals with 2-3 years of networking experience, this certification provides validation of your cloud infrastructure knowledge. Now is the time to learn the cloud computing skills you need to take that next step in your IT career. Abdul Salam is a senior consultant with Energy Services, and author of numerous blogs, books, white papers, and tutorials on cloud computing. He earned his bachelor’s degree in Information Technology, followed by an MBA-IT degree and certifications by Cisco and Juniper Networks. He’s a frequent contributor to CloudTweaks.com. Zafar Gilani is an IT specialist at GfK, Nuremberg. He was an Erasmus Mundus scholar at Universitat Politècnica de Catalunya (UPC) and Kungliga Tekniska högskolan (KTH), with postgraduate studies focused on distributed computing. Salman UI Haq is co-founder and CEO of TunaCode, Inc, which delivers GPU-accelerated computing solutions to time-critical application domains. He’s a frequent CloudTweaks.com contributor, and holds a degree in Computer Systems Engineering.